Hamas claims border separating Israel from Gaza is fictitious, backs rioters' attempts to infiltrate into Israel. A senior Hamas official on Thursday urged “hundreds of thousands” of Arab rioters in Gaza to breach the border fence from Gaza into Israel at protests to coincide with next week's US embassy move to Jerusalem. 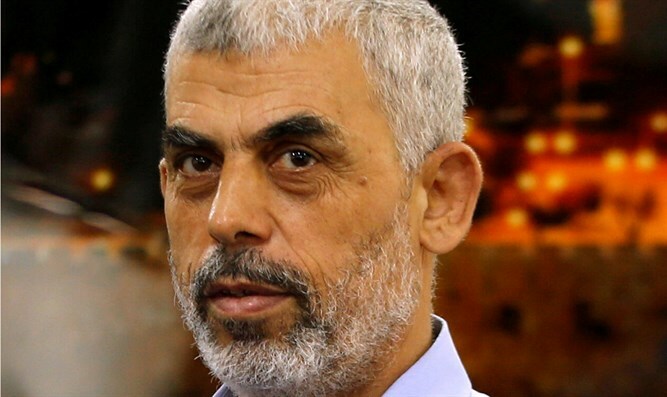 In his first major briefing to international media since becoming Gaza head of the Islamist group in 2017, Yahya Sinwar implied he would like to see hundreds of thousands of Gazans infiltrating into Israel as part of more than a month of violent protests. Asked what he wanted to see from riots on Monday and Tuesday, Sinwar said out Israel has never specifically defined its borders. Fifty-two rioters and terrorists have been killed by Israeli fire since the six weeks of violent clashes dubbed the “March of Return” began on March 30 along the Israel-Gaza frontier. Israel says it only opens fire when necessary to stop infiltrations, attacks and damage to the border fence, while accusing Hamas of seeking to use the riots as cover to carry out violence. Thousands of rioters are expected to gather along the border on Monday, which coincides with the controversial opening of the US embassy in Jerusalem. There are fears protesters could attempt to breach the fence en masse, in an attempt to flood into Israeli territory.